Author Buys Sword – Hurrah! | AUTHOR. ACTOR. SWORDSMAN. Author Buys Sword – Hurrah! 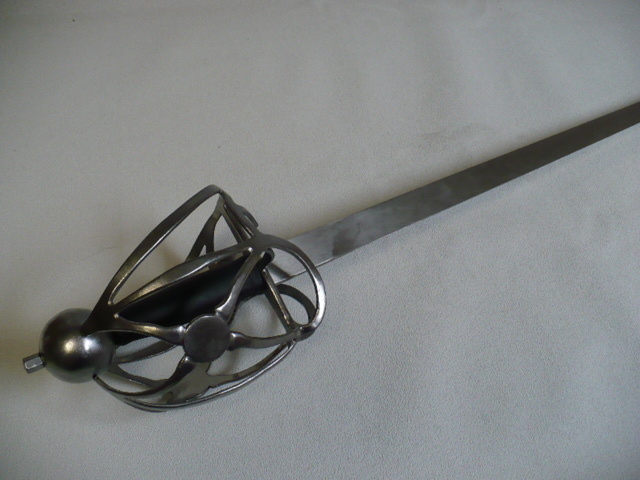 Because I’d decided that I was going to treat myself to a true fighting sword – an English Basket Hilt Backsword, no less, such as my hero from SHAKESPEARE’S REBEL – John Lawley – would have wielded in 1600. The very sword I shall be wielding at the Canadian launch for the book (as I mentioned yesterday) at BARD ON THE BEACH Vancouver on July 22nd. This is it – or a part of it anyway. Though I’ve decided, quite unlike my plain speaking hero, to gussy it up a bit. I shall have a crimson grip. I shall wear oxblood calf skin gloves. Well, how often do I get to throw my dodgy lower limbs around a stage these days clutching bladed weaponry? Might as well go for it, eh! This entry was posted in Uncategorized and tagged historical fiction, novels, public readings, shakespeare, swords, Writing. Bookmark the permalink. 2 Responses to Author Buys Sword – Hurrah! Ah, the Bilbo blade! Wonderful. And love that film. So glad you are keen on all things historical. We few must stick together.